Last week I headed west to Stirling to talk to the Stirling Knights basketball team (@Stirling_BBall) about their nutrition. It was really nice to be approached by the coach and to be able to help offer a more well-rounded knowledge base to compliment their training programmes. Stirling Knights compete at national level and they are open to all ages above 10. 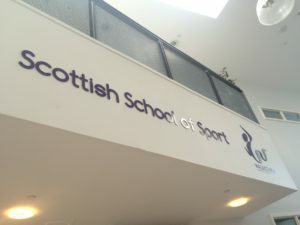 My presentation was held at Wallace High School, which was launched as the Scottish School of Sport in 2012. Here they develop and support talented students in football, rugby, swimming, dance, and of course, basketball. With the Scottish Institute of Sport just across the road, what better way to inspire students to get into sport. As requested by the coach, I covered the basics of food and nutrition last week, to be followed up by more specific topics in the coming months. Basketball players are fuelled by carbohydrates and their carbohydrate requirements for training and competition are likely to be high. Body composition is also key, as they need to be powerful but fast and agile. A bit of endurance will come into play, as matches last up to 50 minutes depending on the level, so it is no good to burn out after 15. With all of these in mind, a good base diet is essential to give the body everything it needs for an appropriate body composition, power, speed, endurance and agility. We discussed types of carbohydrate, energy consumption, protein sources, hydration, bone and muscle strength. I’ve covered a few sports in my talks now – netball, swimming, running, boxing – so if you are looking for some nutritional knowledge for your sports team, let me know!